Seaside Walk Week returned this spring for its second year, celebrating the wonders of the British seaside, paying tribute to the magic of family holidays by the sea and encouraging the nation to explore the Great British coastline with family and friends. The event launched in Scarborough on Sunday 29th May. Starting at the Sun Court Café in the surrounds of the Grade II listed Scarborough Spa, 40 walkers took a leisurely stroll along the coastline around Marine Drive and North Sands to the North Bay Railway. The walk was opened by the new Mayor of Scarborough, Councillor Simon Green, who joined the walkers for the start of the walk. They were also joined by Yorkshire Coast Radio, breakfast radio presenter Paddy and mascot DJ Dex who were popular amongst the walkers and other visitors at the Spa. Expert guides from Hidden Horizons were on hand at points along the route to share fascinating facts about the local history, geology and wildlife, and walkers were even able to spot a nesting peregrine falcon among the kittiwakes nestled into the cliff face of Castle Cliff. Heading up to North Bay Railway, where walkers enjoyed a free ride, there were refreshments including delicious homemade cakes courtesy of Scarborough Hospitality Association, before venturing back to the Spa on the Open Top Bus to explore the rock pools and find dinosaur footprints in the exposed rocks. Volunteers from The Rotary Club of Scarborough Cavaliers kindly gave up their time for the day and helped with the organisation of the event. 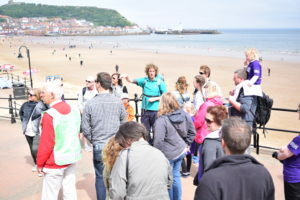 Working in conjunction with Hidden Horizons, Scarborough Borough Council, Scarborough Spa, Welcome to Yorkshire, Scarborough Forum for Tourism, Virgin Trains East Coast and TransPennine Express, walkers were able to discover Scarborough coast whilst helping the Family Holiday Association. During the week, a Thames Treasure Trail walk was held for corporate supporters in London after working hours. Teams were given clues and questions, created by the British Guild of Tourist Guides (Blue Badge Guides), before setting off to answer them whist discovering parts of the Thames they never knew existed. 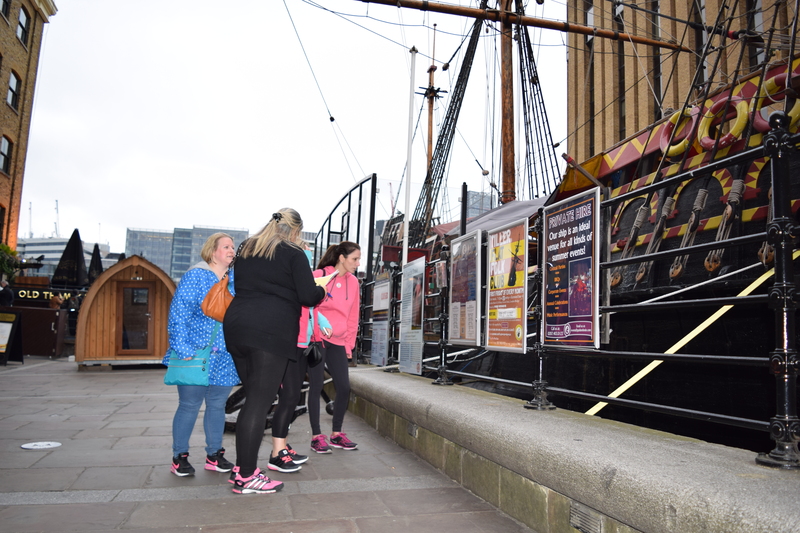 Starting at St Paul’s Cathedral and finishing near London Bridge station, the teams deciphered their way along the river in healthy competition, with the quickest team winning the treasure! 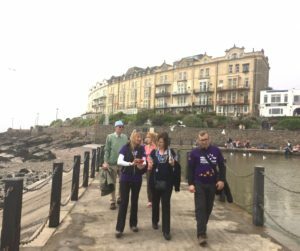 The finale walk took place at Weston-super-Mare on Saturday 4th June. Starting at the railway station, the walkers headed for the Town Hall, Winter Gardens and Royal Crescent before reaching the sea front with views across the two bays. A ‘walk on the waves’ across the Marine Lake causeway brought everyone back along the seafront to the finish where the walkers were greeted with refreshments. As a generous gesture, Great Western Railways were offering free train travel on their network to the walk. 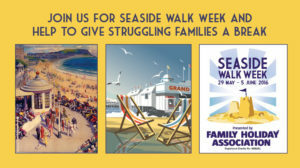 Seaside Walk Week, an annual event, encourages people across the UK to spend time together at the seaside whilst raising awareness and funds for the Family Holiday Association. Spending quality time together as a family away from home offers welcome respite from daily hardship, a new sense of optimism and hope for the future.